Vitamin B17, also known as laetrile or amygdalin, is actually a glycoside, not a vitamin. Although it is sold under the name of vitamin B17, the compound does not actually fulfill the definition of a vitamin, as there is no disease associated with a deficiency in vitamin B17, Vitamins and Health Supplements explains. Sufficient information does not exist to prove the health benefits of vitamin B17. Vitamin B17 is found in the seeds of apricots, rather than in the meat. According to Vitamins and Health Supplements, apricot seeds and the seeds and flesh from most other non-citrus fruits, including apples, peaches, cherries, plums and prunes, may hold a vitamin B17 concentration of 2 to 3 percent. Apricot kernels and apple seeds can hold around 500 milligrams of vitamin B17 per 100 grams. Many types of berries contain vitamin B17, such as strawberries, blueberries, huckleberries and cranberries. 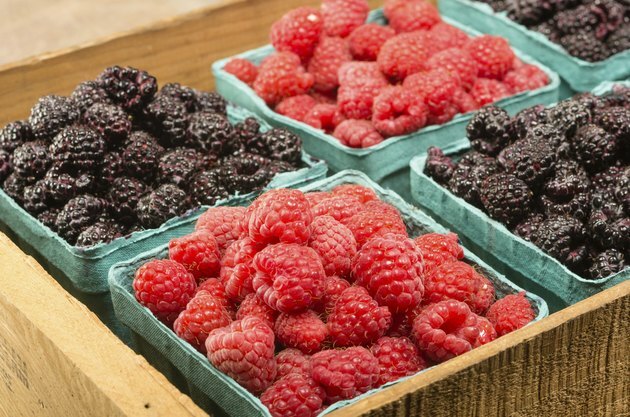 Health.CentreForce.com states that a serving of blackberries, gooseberries, boysenberries, raspberries or elderberries can provide 500 milligrams of vitamin B17. According to VitaminB17.org, 100 grams of bamboo shoots contain around 500 milligrams of vitamin B17. Sprouts and leafy green sources like alfalfa, spinach and eucalyptus contain about 100 milligrams of vitamin B17 per 100 grams. A number of legumes contain vitamin B17 properties. Lima beans and chick peas both hold between 100 and 500 milligrams of B17, according to Health.CentreForce.com. Other legumes and bean sources of vitamin B17 include lentils, green peas and kidney and fava beans. Can Any Supplements Help Stretch Marks? What Foods Are High in Vitamins C & E & Beta-Carotene?